The Golden Globes were handed out last night, with the Hollywood Foreign Press Association honoring the best that movies and TV have to offer. The awards telecast made history before a single statuette was handed out, with this year becoming the first Golden Globes telecast to stream live through the NBC website, along with mobile apps and on various services including DirecTV Now, Fubo TV, Hulu Live TV, Sling TV, Sony PlayStation Vue, and YouTube TV. We have all of the TV winners separated below, but there was only one program that stood ahead of the pack. 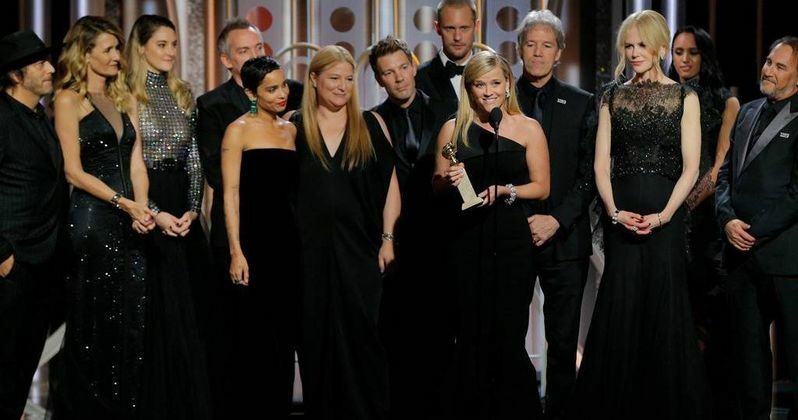 HBO's Big Little Lies was the big TV winner this year, taking home four Golden Globes, winning Best Limited Series, Best Performance by an Actress in a Supporting Role (Laura Dern), Best Performance by an Actor in a Supporting Role (Alexander Skarsgård) and Best Performance by an Actress in a Limited Series (Nicole Kidman). Hulu's The Handmaid's Tale and Amazon's The Marvelous Mrs. Maisel each took home two awards, with The Handmaid's Tale winning Best Drama Series and Best Actress in a Drama Series (Elisabeth Moss) while The Marvelous Mrs. Maisel took home the Best Comedy Series and Best Actress in a Comedy Series (Rachel Brosnahan). One of the biggest highlights of the night for many was the rousing speech delivered by Oprah Winfrey, who became the first ever African-American woman to win the Cecil B. DeMille Award at last night's ceremony. The speech was so powerful, addressing race relations and the #MeToo movement that was touched upon by so many last night, that it has even convinced some that Oprah Winfrey should run for President in the year 2020. Whether or not that will happen remains to be seen, but the TV icon was among the many stars who decided to wear all black last night, showing support and solidarity for the #MeToo movement and another movement called #TimesUp that aims to change the power structure within the Hollywood movie and TV system. The Golden Globes served as the kick-off for awards season, and it's become quite clear from last night's telecast that the biggest stars in the movie and TV industries are committed to change. Almost all of the awards speeches either directly or indirectly referenced the wave of sexual misconduct allegations that have swept through Hollywood, setting the tone for the myriad of awards shows to follow, including next month's Oscars, which will be hosted by Jimmy Kimmel for the second year in a row. Both the #MeToo and the #TimesUp movements were referenced numerous times throughout the awards telecast, in both the acceptance speeches and the opening monologue from host Seth Meyers.